The gist is, almost all functions of the lab are suspended. 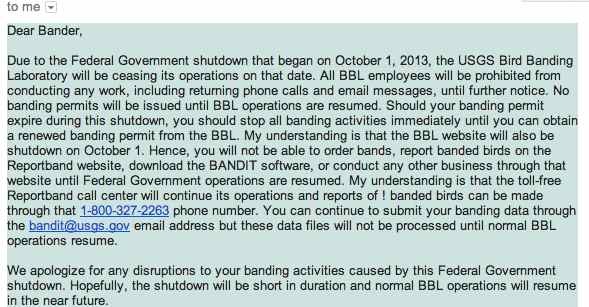 This includes processing banding permits, so if your permit expires before the shutdown is resolved, “you should stop all banding activities immediately.” This means no new bird studies. That’s not great. Did you know I’ve been preparing a big important grant proposal for the NSF that should be due Oct. 10th? The grant proposal preparation website is FastLane; it’s gone. Anyone else preparing any kind of grant application is in the same boat. 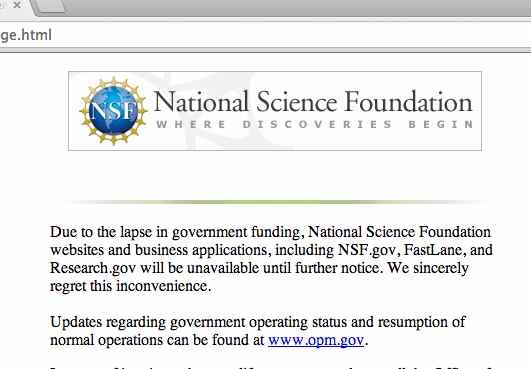 NSF can’t even tell us what will happen once the government resumes because NSF is shut down; “NSF will issue guidance” is the only reassurance it can give. Of course this isn’t a surprise: this is what government shutdown means. But just because it’s predictable doesn’t mean it’s not damaging for science. Remember the campus power outage I was talking about? Fortunately, after much nail-biting and anxious texting, it became clear that some of the scientists and staff who were still on campus when the outage occurred had made sure that any samples not in a freezer on back-up power were moved to freezers that were. In the end, almost no damage was done. I lost a few PCR reactions that were in thermocyclers at the time of the outage; my labmate’s samples were all safe. 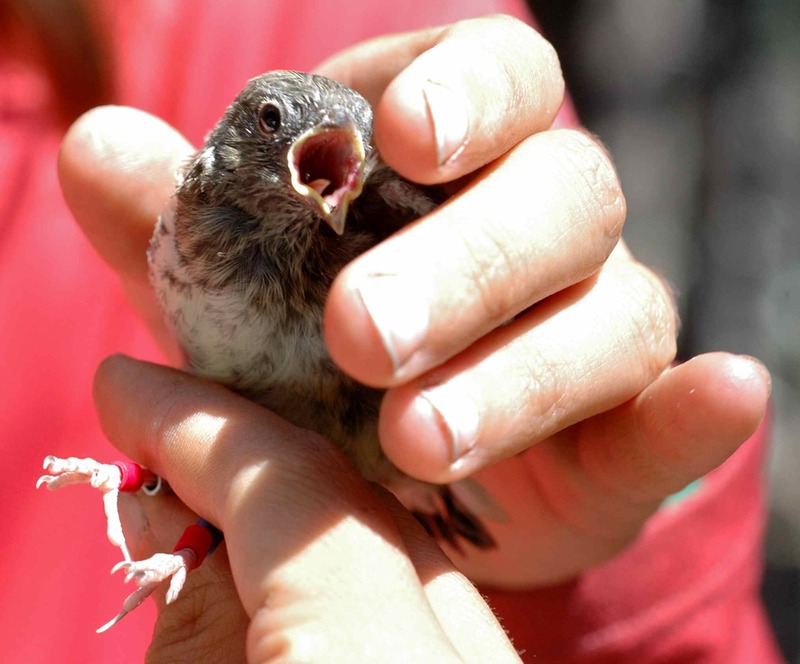 Enormous thanks go out to the people who saved the day for UC Berkeley biologists. We didn’t cause our power outage, but we dealt with it. Now it’s time for the government to deal with the crisis that it did cause. This entry was posted in miscellaneous, my research and tagged government shutdown, NSF, science by toughlittlebirds. Bookmark the permalink. Did you notice that the BART website is down? I wonder if it is for the same reason. Good luck on finishing your grant proposal. Thanks. I’m still working on the grant, but it’s strange now to not know when it might be due. I still get a weird website for BART. It comes up with a BART – API Documentation page. This happened at work and also at home. As a child who grew up in the East Bay–I can recall going for many walks through the campus. It is a very beautiful campus.. Thanks! It is a great campus, with a surprising amount of wildlife for an urban environment. Grrrr…my daughter needs the US Census website for her research, so she is stalled as well. But at least her subjects won’t degrade during the shutdown! How aggravating that must be to her to not be able to get at her data! My sympathies. It is so surreal. Such a staggering thing to just let happen. I hope it gets sorted soon enough for you. Just a mention from a cancer doctor in Britain’s National Health Service, socialised medicine is pretty good and means we can deliver evidence based comprehensive cancer care to everyone based on clinical need free at the point of need. My short stature son gets very expensive growth hormone for the years he needs it without charge. I am amazed that opinion on this should be sufficiently polarised in the States to shut down the government.. It is ridiculous. Especially since in this case it isn’t even about legitimately arguing over the ACA – it already passed! It’s a law! The Supreme Court upheld it! The way to argue with it now is to win the next election, not…. this. Someone once told me that the test of a solid government was what the losing side does. If they continue to try to win using the system, it’s working; if they try to hold a coup or otherwise break the system, you’re in trouble. Well…. That’s an interesting test of solid government that makes sense. I’ve been explaining politics to my kids. In Parliament there are lines in front of government and opposition benches drawn two sword lengths apart, a legacy of less stable times. Still, many years ago, my great uncle crossed his line to thump a government minister. There is a ceremonial mace on a table between the sides. Twenty years ago, a minister was so angered he took it up and whirled it round threatening the opposition, earning himself the name Tarzan. Nowadays, we are apparently civilised. I hope your political vandals sort themselves out. I called by to say I hope you are back in business from tomorrow. I saw your previous comment. its tough enough being a scientist but to lose your experiments like that must be very hard.